The United States Department of Justice (DOJ) and Federal Trade Commission (FTC) help regulate proposed mergers of American businesses. 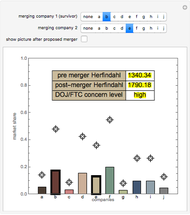 One tool they employ is to compute the pre-merger "Herfindahl Index" of the market and the post-merger "Herfindahl Index." This index measures the concentration of market share on a scale from 0 to 10000. 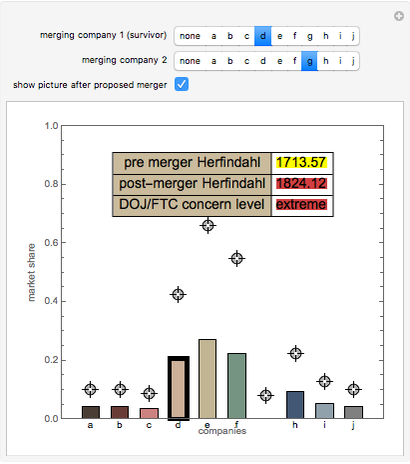 The level of scrutiny the justice department will apply to a merger depends on the Herfindahl-measured concentration of the market after a proposed merger and the change in Herfindhal indices. 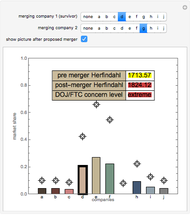 This Demonstration examines a market of 10 firms and lets you select the percent of market held by each firm. 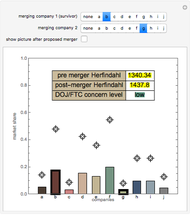 You can then propose mergers amongst the firms and determine the level of scrutiny likely to be given by the DOJ and the FTC. 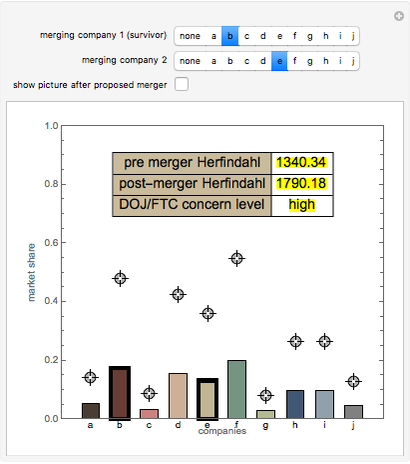 You can choose whether to visualize the market before a merger or after an approved merger. 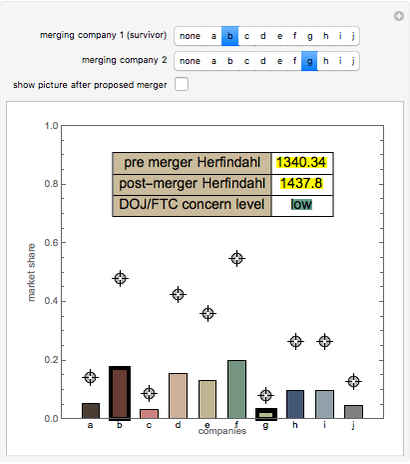 Snapshot 1: the post-merger view of the situation described in the "thumbnail"
The Herfindahl Index is computed in a Pythagorean way as the sum of the squares of the market shares normalized to run between 0 and 10000. This Demonstration is intended for educational purposes and is not intended to provide legal advice. Merger law is complex; consult a licensed attorney if you have questions or concerns about a "real world" merger. Seth J. Chandler "Merger Guidelines"